The best editor helps you easily convert YouTube videos with powerful features. Loved a video on YouTube, but unable to find the MP3 version? Worry not! Now, with a YouTube music converter, you can easily convert YouTube videos into MP3 files for your iPhone and enjoy them to your heart’s content. A trusted brand can offer you the best MP3 audio files out of your favorite YouTube videos within no time. Here we bring 6 free apps to convert music for your iPhone. Video to MP3 Converter is an App that allows you to convert videos into different formats of audio such as AAC, MP3, M4A, OPUS, WAV, and lot more, and save it on your iPhone. You can select audio tracks and customize sample rate, volume, and bitrate. You can decide the starting and ending point of the audio to be converted. You can import audio or video from Album, camera roll, One Drive, Google Drive, Dropbox, or iCloud. You can open audio files with this App and share with other Apps as well. MyMP3 can convert videos available in your device into MP3 quickly. You can save recorded audio into MP3 and WAV format. You can convert local videos into MP3 and share on any social media, email, or instant messaging App. It allows you to edit the metadata. You can record from a microphone, CD, turntable, audio streamed from the internet, Skype call or phone calls, and the likes. It allows ripping CDs, renaming batch files, schedule recordings, silence detection and playlist management while recording vinyl albums. You can use Filmora as YouTube music converter which will help in converting without much effort. Filmora is a asically a video editing software that can help you editing the videos in various ways. You can edit any of your video project with ease when using Filmora. 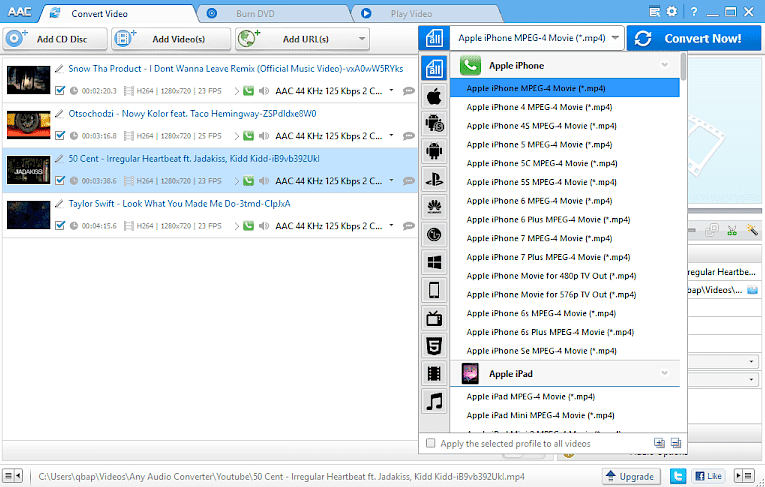 In order to convert Youtube to MP3 in iPhone, you can choose iPhone as the target device while exporting. Let’s check out some amazing features of this software. Anyone can easily use it for its extremely easy interface and design. People can have delight of various graphical features with this tool such as filters and overlays. With this software, one can seamlessly merge multiple videos without compromising quality. There are lots of advanced tool associated with Filmora including backgroung blur option, audio mixer,screen spliting, text editing and more. 4k videos are also supported via Filmora easily. You can have the audios exported to iTunes automatically. Simple 3 step process to download and save YouTube videos into your iPhone. Any Audio Converter is an online converter and downloader that allows you to convert YouTube videos to MP3 for iPhone to your desired quality, and size of audio files. This YouTube music converter can convert downloaded videos and music to AAC, MP3, WAV, and WMA faster with better quality. You can download online videos and music from more than 100 sites. It helps you to rip and extract audio from CDs and videos. It supports audio conversion in multiple formats without compromising the quality. You can burn videos to AVCHD DVD or DVD. You can edit videos with special effects, clip, or crop effects. Softorino YouTube Converter 2 can not only convert YouTube to MP3 for iPhone, but also to MP4 for all iOS devices as well. It is compatible with over 60 top sources. With this App you can access videos, music and ringtones as well. It supports all iOS devices and delivers 4K ultra HD, with subtitles. After going through the list of YouTube music converters in this article, we have found that Filmora is the ultimate solution for all your video download and audio conversion needs. With its matchless features, this App makes your life simple and melodious. However, it is our suggestion, final call will be yours. We would like to know which was your choice and how was the experience using it. Thanks readers for having a glance on this post. We hope you are delighted after reading it and found what you needed. The TubeGeter app is also very good. You can even download mp3 and videos easily using this app.